Several months ago, China announced plans for a Silk Road Economic Belt, which regional business eyes are turning to for unprecedented import and export business opportunities. This article takes a look at how realistic China’s vision for revitalising the silk road through Central Asia to create directly link China and Europe. A so-called ‘maritime route’ for sea cargo throughout South-East Asia and high rail freight infrastructure are now the subject of speculation and discussion. The deciding issue, of course will be potential financing and in particular, the Asian Infrastructure Investment Bank. Before international transportation infrastructure can happen, however, this requires there also being formal, pan-Eurasian institutions in place for dialogue on these and perhaps related development issues. In a China Briefing editorial Chris Devonshire-Ellis, of Dezan Shira & Associates, a foreign investment agency, offered some valuable insights into the potential for China’s Silk Road Vision, given existing networks. This powerful body includes: China, Russia, Kazakhstan, Kyrgyzstan and Uzbekistan. Nations with observer status, are: Iran, India, Afghanistan, Mongolia and Pakistan. Loosely affiliated are Belarus, Sri Lanka and Turkey and the ASEAN and CIS Free Trade Blocs and Turkmenistan are invitees. The SCO largely focusses on regional security. China and central Asia both have problems with radical Islam. However, their main focus is trade, infrastructure, tax reforms and customs issues. Members include: Armenia, Belarus, Kazakhstan, Russia and soon Kyrgyzstan. This represents 170 million people and a huge land mass. Formed early this year, it is the Central Asian nascent version of the European Union and China observes developments here. Reduction of tariff duties between members is key, albeit customs duties are important revenue sources for each. Devonshire-Ellis believes that “the EAEU will only start to fully take off when it adopts… a VAT based consumption system and widens its tax base”. When the EAEU initiates this program of tax reform and eventually signs Free Trade deals with China, ASEAN, the Gulf Cooperation Council and SAARC (South Asian Association for Regional Cooperation) members, this establishes a Free Trade Zone “…stretching from Istanbul to Shanghai and from Moscow to Jakarta covering all points in between”. The EAEU has already signed off an FTA with India and Vietnam. ASEAN members will negotiate individual deals, so it is all to play for. If tax reforms and an FTA with China happen, the Silk Road Vision is likely to become a reality. China takes a long-term approach to investment, looking over 25-30 years and the White Rose Group has looked at some recent developments for international shipment suiting China. China will fund a speed rail link between Moscow and Kazan, Russia’s third most important city. This European section of the Trans-Siberian express opens the Caucasus to Asia, on the Volga River, cutting rail freight down to only three hours. Russia and China are negotiating on this US$ 58 billion project as we write. Other on-going high speed rail projects will unite Beijing and Moscow, such as the Kazakh rail system upgrades, Wroseco have talked about elsewhere. All these developments underpin the re-emergence of the ancient Silk Road. China and Russia are also developing Siberian infrastructure together, to exploit the area’s coal, oil and gas reserves, plus precious metals. China is navigating the North-Eastern channel into the Arctic Ocean, since it continues to unfreeze. Siberia has 22 percent of Russia’s viable arable land, fallow for many years. Russia and China both have the technical expertise to build and renovate existing mining and agricultural facilities, but Russia lacks manpower. However, diplomatic resolution will come, because China needs Russia to successfully implement international transportation routes. Land lease programs are possible for development, such as e.g. steppes or leases agreed such as with the Ukraine. China has demonstrated their willingness to fund overseas projects if conducive to promoting the Silk Road Economic Belt. Investment Bank Grisons Peak say that China’s 67 major international infrastructure projects since 2013 have been related to the Silk Road. A US$ 40 billion specific Silk Road Investment Fund has also been established by China. 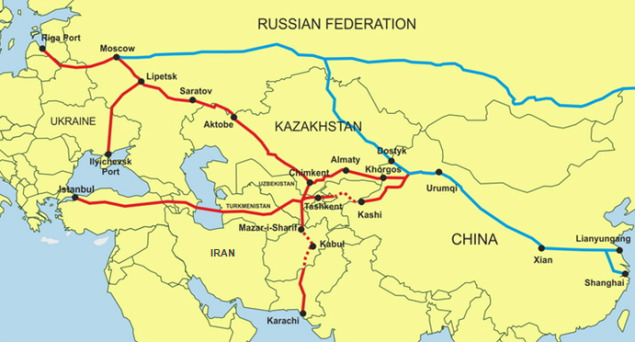 The Asian Infrastructure Investment Bank can call on numerous Prospective Founding Members in Asia, all of whom can benefit from the Silk Road Economic Belt and cover the potential Free Trade Area referred to earlier, including: Australia, Azerbaijan, Bangladesh, Brunei, Cambodia, China, Georgia, Hong Kong, India, Indonesia, Iran, Israel, Jordan, Kazakhstan, Kuwait, Kyrgyzstan, Laos, Malaysia, Maldives, Mongolia, Myanmar, Nepal, New Zealand, Oman, Pakistan, Philippines, Qatar, Russia, Saudi Arabia, Singapore, South Korea, Sri Lanka, Tajikistan, Thailand, Turkey, UAE, Uzbekistan, Vietnam. China, weaving the diplomatic, transport, finance and infrastructural threads together steadily, is keen to see Silk Road routes happen. Against this backdrop of influential trade bodies developing, businesses would do well looking eastwards for expansion. In conclusion, a variety of factors will need to be in place before the Silk Road is a reality. Russian energy oligarchs are likely to also have some influence in this entire process if internal dependence on their products is compromised en route. Tax reform for the CIS and EAEU members states and customs duty revenues changes to VAT or GST based consumption tax systems across Central Asia will also take time. Companies within this vast region must be ready for competition beyond their homelands. Iranian business owners with interests in component parts or services in any sectors related to transport, agriculture, energy or precious metals should contact the White Rose Group to find out how best they can take advantage of the huge opportunities the Silk Road Economic Region offers.